The Tamarack Institute is a connected force for community change. Tamarack’s Learning Centre exists to empower community changemakers to achieve greater impact. We draw upon our 15 years of experience leading community change and advancing practice to support municipalities, funders, non-profits, and community leaders through on-demand coaching and consulting, in-person and digital training, and publications that guide change efforts. Last year alone, over 24,000 changemakers engaged with us and over 90 client organizations contracted us for consulting services to support them through their most pressing challenges. Collective Impact: How can we mobilize collaboration across sectors for systems change? Community Engagement: How can we engage the community to create and realize bold visions for the future? Collaborative Leadership: How can we bring the right people together in constructive ways? Community Innovation: How can we create, test, and scale new approaches? Evaluating Impact: How can we identify and amplify what works? As a registered charity, all of your investments as clients and learners goes back into providing content and tools on an open-source platform to build the capacity in the field. By working with us, you help support the efforts of changemakers in your community and worldwide. Cities Reducing Poverty is a network of more than 175 cities represented by 61 regional partners who are working collaboratively to end poverty in their communities. Building a connected force for community change. Collaboratively create vibrant communities by engaging learning leaders. When we are effective in strengthening community capacity to engage citizens, lead collaboratively, deepen community and reduce poverty, our work will contribute to the building of a more equitable, prosperous, and peaceful society. Tamarack was founded in 2002 by Alan Broadbent of the Avana Capital Corporation and Maytree (Foundation) and Paul Born, President of Tamarack. Their hope was to create an institute that would deeply understand community change and would help organizations and citizens work better together for a collective impact. As a small organization, Tamarack had two big goals. The first was to establish a learning centre that would provide research and document real stories, exemplary practice and effective applications for community change. Today more than 20,000 members participate in the Tamarack learning community and we provide nearly 14,000 people days of training a year. Our learning community members support our work by co-generating knowledge and they contribute more than $2 million annually to sustain this activity. Our second big goal was to apply what we learned to end poverty. Since then, we have effectively helped more than 200,000 households rise out of poverty and have engaged more than 70 cities as partners as we continue pressing toward our goal of changing cities into places that work for all. As communities everywhere face increasingly complex challenges – from climate change to economic inequality to disruptive technologies – Tamarack’s expertise is more relevant than ever. We will continue to grow our learning community to engage citizens in working together to deepen community, rebuild neighbourhoods, make it easier for us to care for each other, and improve our cities. We embrace the words of Margaret Wheatley, that “all change, even very large and powerful change, starts from very small conversations held among people who care.” We welcome you to the conversation. Tamarack Institute for Community Engagement is co-founded by Paul Born (President) and Alan Broadbent (Chairman). Maytree and The J. W. McConnell Family Foundation are our key donors. 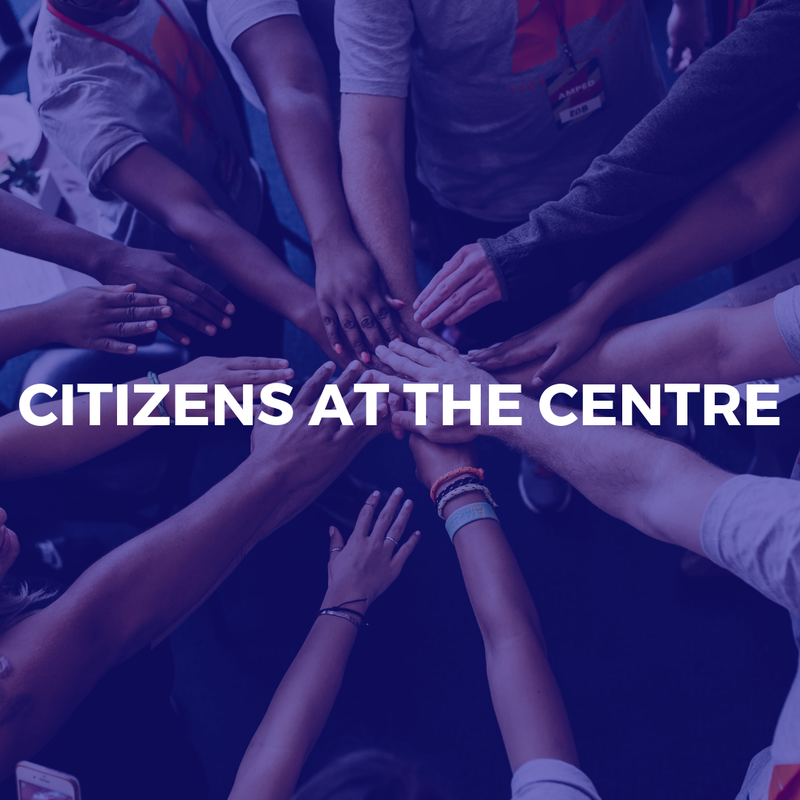 Tamarack partners with J. W. McConnell Family Foundation and Caledon Institute on Social Policy to create Vibrant Communities- Cities Reducing Poverty. Mark Cabaj is hired as Vibrant Communities First Executive Director. Engage, Tamarack’s e-magazine is launched growing to 14,000 subscribers by 2017. Vibrant Communities Canada launches a 10-year experiment in poverty reduction with 13 Trail Builder cities across Canada. Vibrant Communities experiments with a broader learning community that includes a website, tele-learning, and action-research projects. Tamarack’s signature 5-day learning event, the Community Change Institute (formerly Communities Collaborating for Impact), is launched. By 2017, this learning event is attended by nearly 3,000 learners. Tamarack publishes Creating Vibrant Communities – How Individuals and Organizations from Diverse Sectors of Society are Coming Together to Reduce Poverty in Canada, (Paul Born – Editor) capturing and sharing the stories of Vibrant Communities Trail Builders. Vibrant Communities hosts a Strategic Dialogue on Poverty Reduction with 45 leaders from across Canada to determine the next steps in growing this national program. Liz Weaver becomes Vibrant Communities Second Executive Director. Tamarack publishes Cities Reducing Poverty (Mark Cabaj Editor) which details six case studies of community efforts to reduce poverty. Results from the Trail Builder cities reducing poverty show that the experiment has supported nearly 294,000 Canadians on their journey out of poverty. This successful model is opened to as many cities as possible. Tamarack launches its Cities Deepening Community practice area to explore practical ways to create stronger neighbourhoods and more connected communities. On the Eve of our 15th anniversary Tamarack makes a bold move and appoints Liz Weaver and Paul Born as Co CEO’s. The organization moves forward in a bold new way growing learning opportunities and expanding Cities Reducing Poverty and Cities Deepening Community for members across North America and around the world. We invite you to read our 2017 Annual Report which features highlights from 2017 and our plan forward over the coming years. 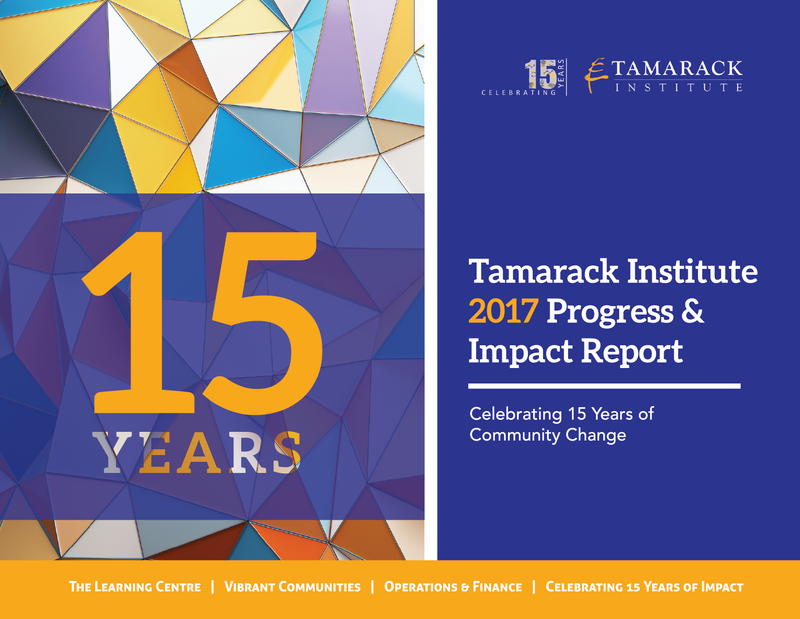 As it is Tamarack's 15 year anniversary, it also includes a special reflection. We also welcome your feedback and invite you to share ideas or your own stories about the work of this Institute and its meaning for you. We thank you - our partners, members and key supporters - for your contributions to this robust learning network. Your combined efforts enable this network to be a connected force for community change. Thank you to our most generous funders and partners who make our work possible. Thank you to our supporters for in-kind contributions. We also want to recognize and thank our many event and program sponsors and partners, who contribute significantly to growing our learning community. Our full list of partners and supporters is published in our Annual Report.